Synopsis: A life crisis causes a socialite to head to San Francisco, where she reconnects with her sister. Review: I was pretty sure I was going to like Blue Jasmine for the mere fact that I didn’t enjoy Woody Allen’s previous film, 2012’s To Rome with Love. Let me explain. Like the Cohen Brothers, I tend to respond well to Allen’s projects about half the time because even a filmmaker as prolific as Allen tends to deliver a few snoozers along the way. So after winning an Oscar for writing 2011’s Midnight in Paris it wasn’t a huge shock that I found To Rome with Love lacking. Thankfully, Allen has returned stateside (the movie is set in San Francisco and New York City) for his latest work and it’s an absolute winner on every level. 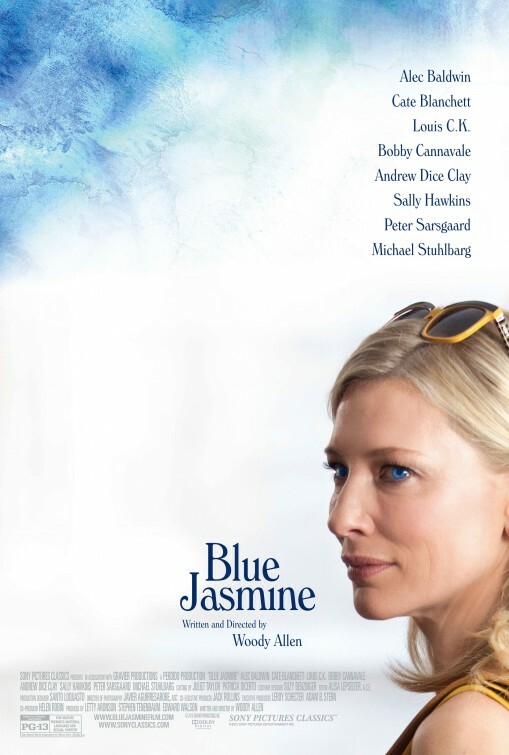 A movie with shades of Tennessee Williams as filtered through Allen’s efficient dialogue, Blue Jasmine finds Allen on the tippy-top of his game with an assembled cast that is both surprising and surprisingly effective. I chuckled a bit when I saw that notorious comic Andrew Dice Clay was turning up in a supporting role but the comedian acquits himself nicely with a role that appears was written specifically for him. Another comedian, Louis C.K., has a brief but enjoyable turn in a part that most surely would have been played by Allen himself were the director a few decades younger. I normally find Alec Baldwin (Rock of Ages) to be an actor that colors his acting with broader strokes than necessary but here we find the actor at his most restrained and believable. It felt like Baldwin took the time to craft this tricky character (only seen in flashbacks) from the ground up rather than pulling a performance from his wheelhouse to repurpose. Sally Hawkins convincingly doffs her UK accent for an US one of indeterminate location (one minor quibble I did have was that everyone on the West Coast seemed to have an East Coast accent and vice versa) as she takes on a familiar role to anyone that is acquainted with Allen’s long list of family dramas. She’s the put-upon sister that rolls with the punches and perhaps allows herself to be more of a punching bag than the audience would like. Still, there’s a prideful dignity in the way she handles new changes in her life that contrasts nicely with Cate Blanchett as her acerbic sister. Ah yes…Cate Blanchett. If there’s any doubt remaining that Blanchett is one of the best actresses of her generation, it will be put to rest with her performance here. We’ve seen these types of cluelessly delusional characters before (most recently in the awful Kristen Wiig film Girl Most Likely) and know that it takes a special kind of actress to take someone so unlovable and allow them to be loved for their faults. Moving into her sister’s modest San Francisco apartment after her Ponzi-scheming husband loses their great fortune, Blanchett’s Jasmine is forced to start over again and get used to a much less lavish way of living. She hilariously tries to school her sister on luxury living, starts taking community college computer classes, fends off the attention of an amorous employer, and attracts the attention of a suitor (Peter Sarsgaard, Robot & Frank) who might just be her savior. In less skilled hands these vignettes could only be played for laughs and while many of these situations provide great humor they are all tinged with more than a little sadness. Sadness for the past that can’t be replayed and for the future that is frighteningly unknown. More than ever, I noticed the attention to detail in Blue Jasmine. Allen’s films always have a nice sheen to them but this one just glows…whether it is in the vistas of California or the Park Avenue lavishness of Blanchett’s former life. I especially loved Sonia Grande’s costume design…Blanchett has very little worldly possessions left and that includes her clothes. Attentive viewers will notice she wears different combinations of the same half dozen articles of clothing she has…and manages to make each outfit look unique. It’s a small touch that speaks volumes about the resourcefulness of the character…and also her need to make her outwardly put-together appearance cover up her inner turmoil. Blanchett is rarely off screen and that’s fine and dandy. In fact, it’s when she’s not the center of attention that the movie loses a little bit of air…which would probably please her character greatly. The performance is razor sharp and the actress is in tune with everything going on around her – that’s thanks to Blanchett’s great instincts and the way that Allen has etched out her journey. The film flies by and arrives at its conclusion with a certain grace not found in many mainstream movies today. The ends that need to be tied off are complete but there’s more than a few loose strands that haunted me even now writing this review. This is a film that will surely land those involved in prime positions when award season comes around. Blanchett is richly deserving of an Oscar nomination as is Allen’s wonderful script and direction. The picture itself should find its way to the Oscar list of Best Picture nominees so it’s safe to say that this is a must-see. It’s damn good.